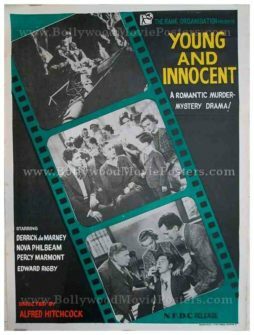 Original Alfred Hitchcock movie poster of the classic crime thriller, Young and Innocent (1937) for sale. This is an actual surviving poster of Young and Innocent (The Girl Was Young), which was released in India by the National Film Development Corporation of India (NFDC). Printed and circulated in India somewhere in the 1970s/1980s during the film’s release in India, this poster was originally intended for publicity but never ended up being used. This original Alfred Hitchcock movie poster uses a photographic still cut paste technique in its design. Three black and white still photographs of key scenes from the film appear encased inside a film reel on the poster. The poster is set against a minimalistic black background. Young and Innocent (American title: The Girl Was Young) is a 1937 British crime thriller film directed by Alfred Hitchcock. The film is based on the 1936 novel, “A Shilling for Candles” by Josephine Tey. Young and Innocent tells the story about a young man on the run for suspected murder who enlists the help of a woman to prove his innocence. A signature style in most of his films, Alfred Hitchcock appears in a cameo in Young and Innocent. 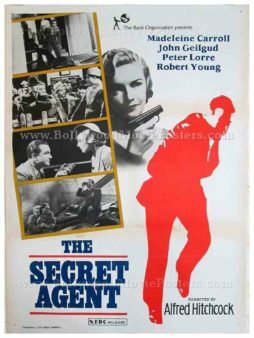 Original Alfred Hitchcock movie poster of the classic thriller, Secret Agent (1936) for sale. This is an actual surviving poster of Secret Agent, which was released in India by the National Film Development Corporation of India (NFDC). Printed and circulated in India somewhere in the 1970s/1980s during the film's release in India, this Alfred Hitchcock poster was originally intended for publicity but never ended up being used. This poster uses a photographic still cut paste technique in its design. On the right hand side, a running silhouette of a man appears printed in red. Four black and white still photographs of key scenes from the film are pasted on the left of the poster. The leading lady of the film is seen holding a gun on top of this original Alfred Hitchcock movie poster. The poster is set against a minimalistic blank background. Secret Agent (1936) is a hit British film directed by Alfred Hitchcock. The movie bears Alfred Hitchcock's signature themes of murder and suspense. The plot of the film revolves around three British agents sent to assassinate a mysterious German spy during World War I. Original Alfred Hitchcock movie poster of the classic Alfred Hitchcock thriller, The Lady Vanishes (1938) for sale. This is an actual surviving poster of The Lady Vanishes, which was released in India by the National Film Development Corporation of India (NFDC). 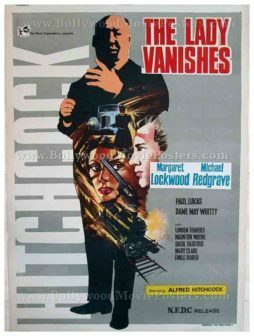 The Lady Vanishes is one of the best British thrillers ever made by the most influential filmmaker of all time, Alfred Hitchcock, making this poster highly collectible. Printed and circulated in India somewhere in the 1970s/1980s during the film’s release in India, this Alfred Hitchcock poster was originally intended for publicity but never ended up being used. This expertly hand drawn poster features a brilliant semi-transparent silhouette of Alfred Hitchcock, with impressions of the train, a police wagon as well as two key characters from the film appearing inside. This Alfred Hitchcock poster features the word Hitchcock predominantly on the left. The Lady Vanishes is a 1938 hit British comic thriller directed by Alfred Hitchcock. The film is based on the 1936 novel, “The Wheel Spins” by Ethel Lina White. As the title suggests, the film is about an English tourist who discovers that her elderly traveling companion seems to have disappeared from the train they are traveling on. The Lady Vanishes is Hitchcock’s penultimate film made in the United Kingdom before his move to the United States. The film remains one of Hitchcock’s best known British films. A remake of the film, also titled The Lady Vanishes, was made in 1979. The Lady Vanishes was named Best Picture of 1938 by the The New York Times. In 1939, Hitchcock received the New York Film Critics Circle Award for Best Director for The Lady Vanishes. Original Alfred Hitchcock movie poster of the classic thriller, The 39 Steps (1935) for sale. 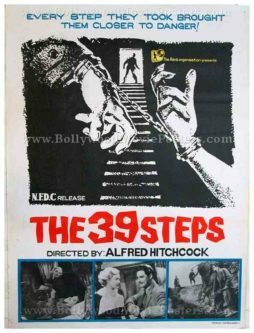 This is an actual surviving poster of The 39 Steps, which was released in India by the National Film Development Corporation of India (NFDC). The 39 Steps is considered as the greatest British film ever made, making this poster highly collectible. This poster features a combination of two design techniques – hand painted / hand drawn as well as photographic still cut paste. The center of the poster features a black and white hand painted image depicting two hands handcuffed to each other, whereas a large staircase is seen in the dark background with its steps clearly visible. Still photographs of key scenes from the film are pasted on the bottom of the poster. This original Alfred Hitchcock poster is set against a minimalistic blank background. Typography used in the film's title correlates with its thriller genre – painted in red. The 39 Steps is a blockbuster 1935 thriller film directed by Alfred Hitchcock and starring Robert Donat. Based on the 1915 adventure novel The Thirty-Nine Steps by John Buchan, the film is about a man in London who tries to help a counter-espionage agent prevent an organization of spies called The 39 Steps from stealing top secret information. Like most of his films, Alfred Hitchcock is seen in a cameo in The 39 Steps. Original Alfred Hitchcock movie poster of the classic thriller, Sabotage (1936) for sale. This is an actual surviving vintage poster of Sabotage, which was released in India by the National Film Development Corporation of India (NFDC). 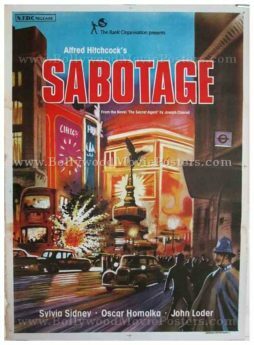 Sabotage is a classic thriller directed by the most influential filmmaker of all time, Alfred Hitchcock, making this poster highly collectible. This expertly hand painted poster features an iconic scene from the film. A bus is seen exploding in the middle of a busy street due to a terrorist attack. The poster credits the novel the film is based on at the top. Sabotage, also released as The Woman Alone, is a 1936 British thriller film directed by Sir Alfred Hitchcock. It is based on Joseph Conrad’s novel The Secret Agent. Sir Alfred Hitchcock, the most influential filmmaker of all time, directed more than fifty feature films in his illustrious career spanning a total of six decades. Through cameo appearances in his own films, Alfred Hitchcock became a cultural icon.